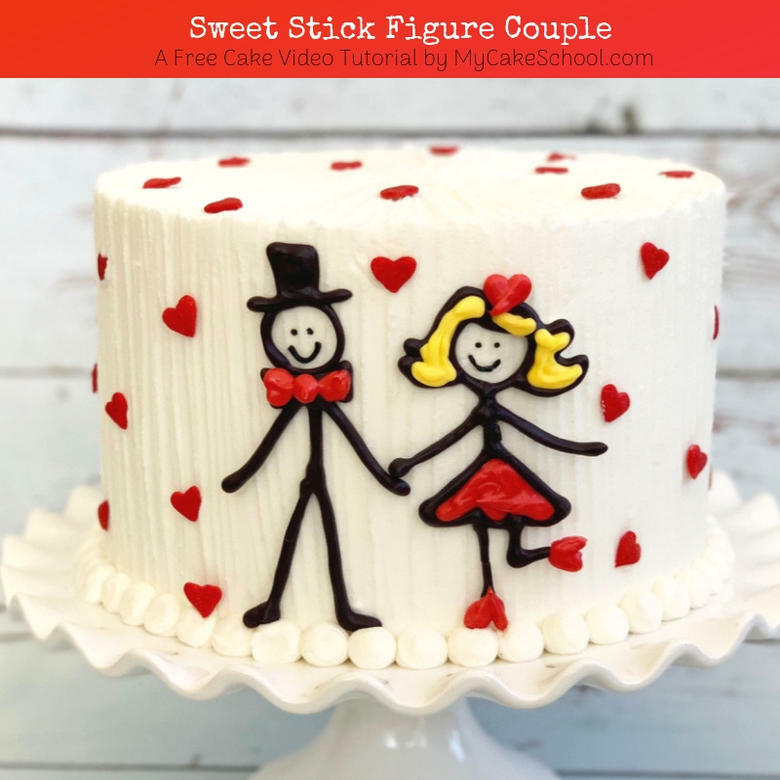 Today, we’re going to show you how to create an easy and adorable cake featuring a sweet stick figure couple! 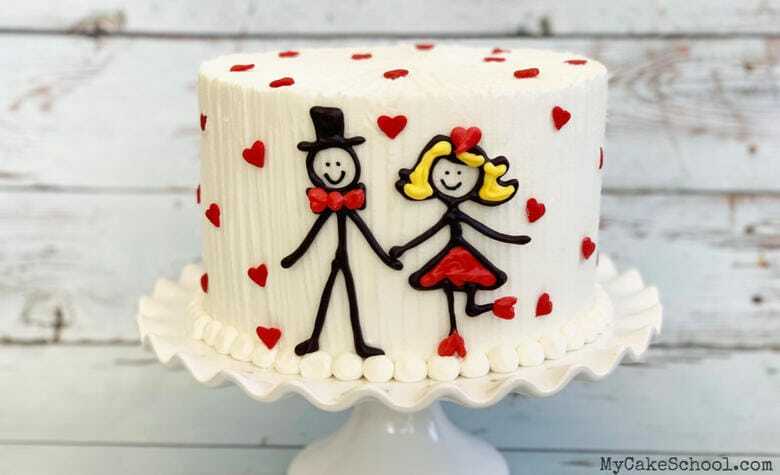 This is such a cute cake design for anniversaries, Valentine’s Day, engagement party, or any occasion celebrating a happy couple. There’s just something so cheerful about stick figure drawings, isn’t there? 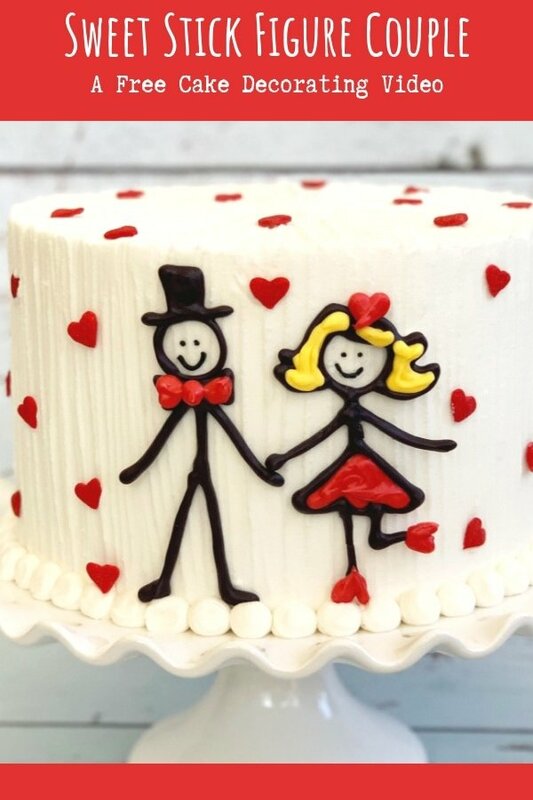 Years ago, we made cake for Father’s Day featuring a stick figure family. We had so much fun with it that we decided to revisit stick figures again this year! Then we chilled them and placed onto the cake! If you would prefer, you could also do your figures in buttercream if you are comfortable with free handing the design right onto the cake. However, what I like about the chocolate candy coating is that it gives our people a little dimension, and we could use a template. We hope that you enjoy this free cake tutorial! Make sure to check out our materials section and additional notes below the video! This design would be great for cakes of all sizes. Our cake was an 8 inch tier which stands 5 inches tall. We frosted our cake in our Fluffy Vanilla Buttercream, and textured it with a small tapered offset spatula. The cake is resting on it’s own cake cardboard cut down to the size of the cake. Piping Tips: I used a tip 12 for the ball border, and a tip 2 for piping the chocolate figures. If using pre-colored Wilton candy melts, you may need to mix in a little melted vegetable shortening if the consistency after melting is too thick. As you saw in the video, I like to make two of everything when making chocolate decorations like this as they are so thin and can be fragile. To prevent breakage, it’s a good idea to trace over your template twice so that the figures aren’t quite so thin. Also, chill your figures before handling them. Just a few minutes in the freezer should be enough to firm them up! New Year’s Eve Cake Tutorial- Pour the Champagne!